It is with deep sadness that we announce the sudden death of Nigel Trenholme. Nigel had been a stalwart of the choir and served the choir well as our Chairman. Nigel quietly got on with his role, leading by example, but as Simon said at rehearsal last night “without any drama”. Nigel was responsible for encouraging the choir to develop a strong identity with our new logo and website. 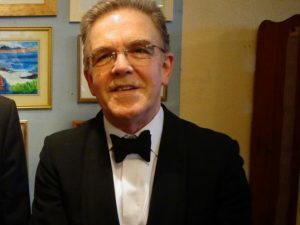 Nigel was generous with his time for the choir as well as generous with financial support, enabling the choir to continue its mission of raising funds for Overgate Hospice. Our thoughts and prayers at this very sad time are with Nigel’s family, especially his wife Jane and two sons. Nigel’s funeral will be held at Coley Church on Monday 18th December at 1.30pm. We are sad to announce that Mrs Sylvia Graucob, MBE died on 6th November 2017. Mrs Graucob was a major force behind the establishment of Overgate Hospice. A memorial service will be held at All Saints Church, Elland on Thursday 30th November at 1.30pm. The choir will be singing two pieces and are asked to arrive at 12.30. Parking may be difficult, so do arrive in good time. Singers are invited to attend “Berties” for refreshments after the service. Please confirm at rehearsal on Wednesday 22nd November if you able to sing at the memorial service, collecting the relevant music, and if you wish to join the family at Berties – lists on the usual table. Sylvia Graucob first came to live in Overgate, the family home of her husband Find, when they got married. On the same plot as Overgate stood another house, Hazeldene, with magnificent rose gardens surrounding both. It was not long before Sylvia fell in love with the house. Many years of happy marriage passed within its walls, and she always found it a peaceful place to be. It was only when Find became ill that the couple decided to move to Jersey. The houses were at this time owned by the company, Nu–Swift, which Find had founded and successfully built up in Elland. Two years later, Find unfortunately died. When Sylvia returned to the house she spent many hours wandering through its emptiness, and it was at one of these times that she had the idea to do something with the house so it would not be sold and converted to smaller houses, which was the fate of the large property next door. Sylvia looked into buying the house and gardens from Nu-Swift and was successful in purchasing them. Her first idea was to perhaps have it as an elderly people’s home. While she was thinking about the possibilities it was made known to her that two doctors in the area were looking to purchase a large property in which to create the first ever Hospice for Calderdale. Finally in 1979, Sylvia met with Dr Quinn, one of the founders, who inspired her with his vision of what a hospice could provide for the community. In those days there were only 60 hospices in the whole country so barely anybody knew much about them. Sylvia recalled her mother saying “you can’t call it a ‘hospice'” not realising they were a rare, but already established, institution in the UK. Sylvia believed that Dr Quinn and the committee behind him would be able to put her beloved Overgate to good use, and so it was handed over shortly afterwards. Sylvia and Find had once brought a large rusty coloured key home from a Palazzo on the Grand Canal in Venice, and with the Halifax Courier present to record the occasion, the key was symbolically handed over. Dr Quinn suggested the name ‘Graucob House’ but it was thought that might cause many spelling mistakes! Sylvia suggested Overgate instead, thus in-keeping with the old name. From its beginnings Overgate relied heavily on volunteers to help establish it. In the first ten years Sylvia came once a month overseeing the renovations and there were three particularly committed volunteers Mrs Stephanie Rourke, Mr Philip Taylor and Mr Douglas Calvert, who did a great deal for the hospice. To this day, Overgate relies very much on the goodwill of the community and volunteers who carry out a variety of roles from serving tea to fundraising. In 1981 the first part of the building to open was the upper floor, which had been the family bedrooms, as an inpatient hospice. At the same time the first Palliative Care nurse post in Calderdale was introduced and it made sense for the nurse to be based at the Hospice. The links between what became known as the MacMillan nursing service and the hospice were forged in those early days. Later, when the MacMillan service became much larger, it moved to the Cancer Unit opened at Calderdale Royal Hospital though both services still work closely together.